On the 16th (Thu), take some stellar pictures from Jingmaham Living Root Bridge and then take a stroll through Mawlynnong Village. Plan my day in Mawlynnong using traveler tips and tourist information provided by Inspirock. New Delhi to Mawlynnong is an approximately 9.5-hour flight. You can also drive. Wrap up your sightseeing on the 16th (Thu) early enough to drive to Shillong. Get a sense of the local culture at Don Bosco Centre for Indigenous Cultures and Police Bazar. Eschew the tourist crowds and head to All Saints Church and David Scott Trail. There's lots more to do: explore the activities along Umiam Lake, take in the architecture and atmosphere at Cathedral of Mary Help of Christians, look for all kinds of wild species at Mawphlang Sacred Forest, and take in the dramatic scenery at Elephant Falls. To see ratings, where to stay, traveler tips, and other tourist information, read our Shillong trip planner . Getting from Mawlynnong to Shillong by car takes about 2.5 hours. 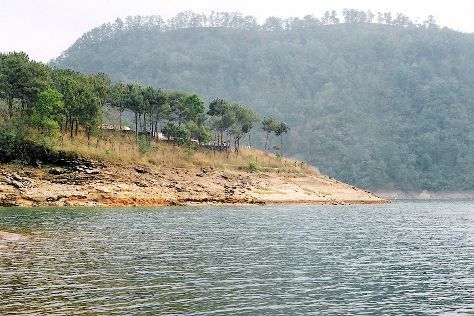 May in Shillong sees daily highs of 38°C and lows of 26°C at night. Cap off your sightseeing on the 20th (Mon) early enough to travel back home.